VLMC crashed a lot until today when I was finally able to edit a video and upload it to YouTube (but YouTube failed to convert it) through VLMC so I though this would be a good time to post about it on WebUpd8. The PPA will be updated daily from the VLMC git using a small script I've created. VideoLan Movie Creator (VLMC) comes in a PPA of its own, so don't worry about this PPA breaking stuff on your system - it won't! There are new packages uploaded daily, so VLMC might occasionally not work - this is not something I am in control of so you can report the bugs @ VLMC devs. Before installing VLMC, please note: VideoLan Movie Creator is still very buggy for now and it doesn't have too many features for now so only use it for testing purposes! Also, I've only tested it in Ubuntu 10.10 so I don't even know if it actually works in Ubuntu 10.04. Important! Ubuntu 10.04: VideoLan Movie Creator only works with VLC 1.1.x so you'll need to install VLC: Install VLC 1.1.4 In Ubuntu [Via New PPA!]. This is not required for Ubuntu 10.10 Maverick Meerkat as VLC 1.1.x is already in the Ubuntu official repositories. 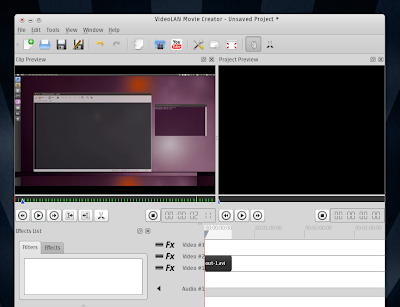 And you can then access it via Applications > Sound & Video > VideoLan Movie Creator. Thanks to falkTX for the VLMC debianization!